Everything gets "quilted" in Paducah during the annual show!! William Clark, of Lewis & Clark fame, platted Paducah in 1827 at the northernmost point of what is now the Tennessee Tombigbee Waterway, he named it in honor of the Padouca Indians. Its strategic location at the confluence of the Ohio and Tennessee rivers make it a hub of commerce and recreation. Besides being the recognized US capitol of quilting, the city offers a vibrant arts community, centered in the city's historical district. For more information on Paducah, see the link below to the city's Convention & Visitor's Bureau. 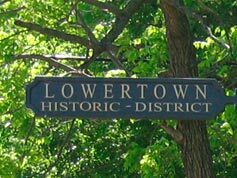 Jo particularly enjoyed touring the Lowertown Historic District that is also the center, as you might guess, of the city's artisan community. The Paducah Trolley runs a regular route through the downtown and lowertown arts districts. During the Quilt Show the Trolley rides are free. 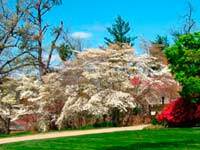 Visitors to Paducah in mid-April will enjoy touring the Dogwood Trail. Learn more about the annual Dogwood Celebration here. On the Banks of the Ohio . . .
< < < A couple in the park watch the Mississippi Queen River Boat paddle on by. About 20 miles east of Paducah, Grand Rivers, Kentucky has an interesting collection of unique gift shops, artisan shops, antique stores. . . including Patti's 1800 Settlement & Restaurant. 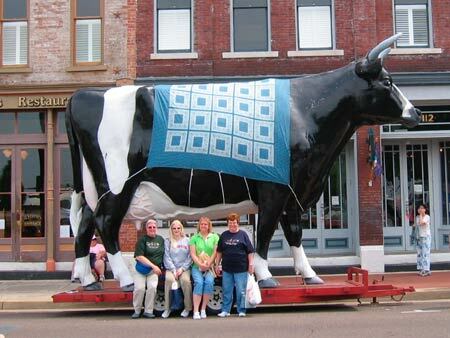 Grand Rivers also sponsors a Quilt Show during the same time period of the Paducah AQS Show. The nearby Canal Park campground is a popular spot for RV'ers attending the Paducah show.